Water is the ultimate equalizer. Canoeing and kayaking are activities that emphasize ability. Skill is determined by ability and attitude, and people at all skill levels, with and without disabilities, can find enjoyment in canoeing and kayaking. All that paddlers need are the willingness to accept instruction and be challenged and the ability to adapt to new situations. <i>Canoeing and Kayaking for People With Disabilities</i> presents strategies that give people of all abilities the opportunity to discover the challenge, freedom, and renewal found in paddling. The book, written by adaptive paddling pioneer Janet A. Zeller, will help you build on your existing knowledge of paddling techniques so you can share the sport with a variety of people with disabilities. Zeller presents best practices based on her years of experience as a paddler with a disability and the experiences of other instructors and recreation and health care professionals. The text includes tested instructional techniques and equipment adaptations as well as safety information and rescue protocols. By focusing on each person’s ability, outdoor professionals, paddling instructors, and recreation providers can learn how to make paddling available to those with disabilities. These topics are presented in the text: <ul><li>General guidelines for working with people with disabilities <li>Information on legal requirements, including accessibility at facilities and launching and landing sites, program access, development of eligibility criteria, and assessment of facility accessibility <li>Thorough coverage of common disabilities, their implications for instructors, and teaching strategies and adaptations for each disability <li>Guidance in choosing gear and modifying or building equipment to meet the needs of paddlers with disabilities <li>Consideration of safety and risk factors, rescue priorities, and adaptations for rolling <li>Factors to consider when planning a trip, including the ratio of paddlers with and without disabilities, taking wheelchairs and mobility devices on the trip, and route selection</ul> The book also includes numerous resources, checklists, and forms to assist you in running your program. Pretrip resources such as the medical information form and the Paddler’s Interview will help you collect information about each paddler’s medical history and discuss expectations, ability levels, and concerns. You’ll also find tips on choosing trip and instruction locations, gear checklists, and an emergency response plan checklist. A glossary provides information on diseases and conditions to assist paddling instructors in developing appropriate accommodations. Paddling provides unique opportunities for people of all abilities to overcome personal challenges, master new skills, experience the outdoors, and enjoy physical activity with fellow paddlers. Packed with information about safe adaptations, techniques, and integrated opportunities, <i>Canoeing and Kayaking for People With Disabilities</i> is your resource for making paddling a reality for those with disabilities. Janet A. Zeller is a lifelong paddler experienced in both canoeing and sea kayaking. After a 1984 accident resulted in quadriplegia, Zeller was determined to return to paddling. 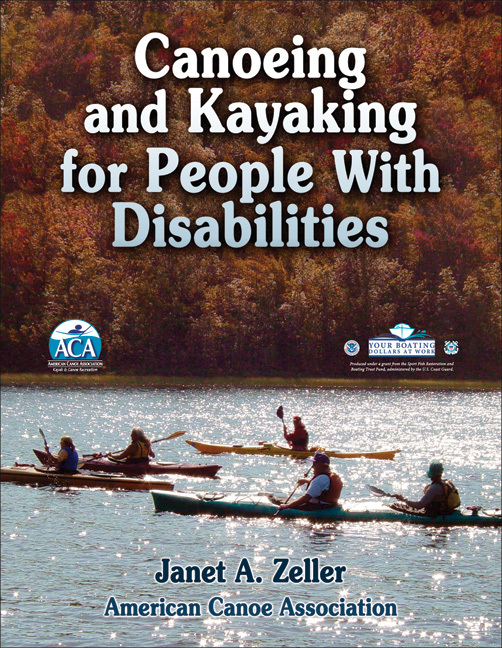 Since that time, Zeller has worked to provide instructors with the knowledge, techniques, and tools to help people with disabilities access canoeing and kayaking opportunities. In 1989 Zeller developed the integrated adaptive paddling program for the American Canoe Association (ACA). With Annie Wortham Webre, she coauthored the first book focused on opening the sport to paddlers with disabilities. Since 1990 Zeller has traveled nationwide as an ACA instructor trainer educator of adaptive paddling workshops. She trains canoeing and kayaking instructors, recreation and health care students and professionals, and those who run water-based recreation programs in the techniques for integrating people with disabilities into their programs. Zeller is the National Accessibility Program manager for the U.S. Forest Service, author of numerous articles, and a frequent presenter on accessibility, universal design, and inclusive outdoor recreation at national, regional, university, and local forums. In her free time she enjoys sea kayaking, canoeing, and wilderness camping.